The cover image features a man in a suit with arrows jutting out below his belt. Bloomberg Businessweek's latest cover is sure to grab your attention. The July 15th cover story “The Hedge Fund Myth” takes on the discrepancy between hedge funds’ reputation as money-making powerhouses and the reality -- that most firms don't live up to expectations. The cover art not-so-subtly compares hedge fund returns to male sexual impotence. Jutting out below a businessman's belt is a thick straight green arrow pointing upwards and another thin, irregular red arrow falling to the bottom of the page. The green arrow represents the perception about hedge funds and the red one, the disappointing reality for most investors, according to the magazine cover. Bloomberg Businessweek’s Sheelah Kolhatkar wrote that according to a recent Wall Street report hedge fund performance lagged Standard & Poor’s 500-stock index by about 10 percentage points, "although most fund managers still charged enormous fees in exchange for access to their brilliance." 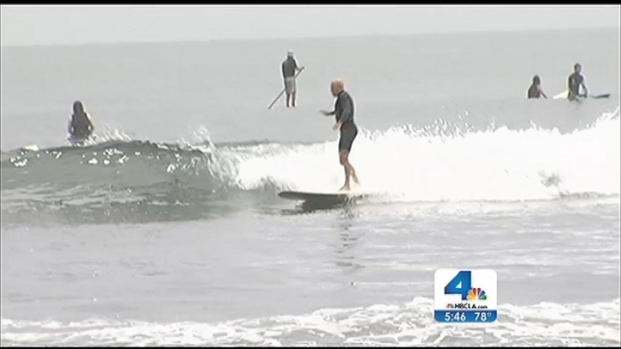 Pirate surf companies have been sprouting up on Southern California beaches. These pirate companies do not have proper permits, and authorities say that is unfair and unsafe. Angie Crouch reports from Santa Monica for NBC4 News. Hedge funds are supposed to "generate 'alpha,' a macho term for risk-adjusted returns that surpass the overall market," but have fallen short, Kolhatkar wrote. Judging by readers' reactions on social media, there was nothing ambiguous about the cover.